My fish sandwich and lentil soup in Istanbul, Turkey. Turkey wasn’t on the initial agenda when we went backpacking in the Middle East and surrounding countries, but we ended up spending a whopping 3 weeks in Turkey in the end, compared with our 10 days in each of Armenia and Azerbaijan! This gave me a chance to sample the delights of Adana, Istanbul, Dogubayazit, Ankara, Trabzon and Cappadocia. 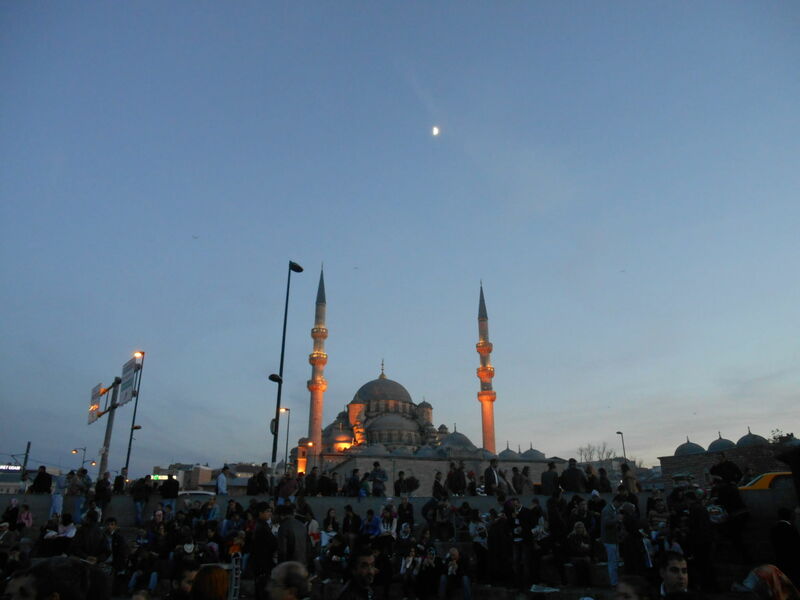 Istanbul has culture oozing from its very core. I don’t admit I fell in love with the city, I preferred Ankara, but the charm of Europe meeting Asia in Istanbul gives it something special. Then there’s the cheap “fish sandwich”. The what? 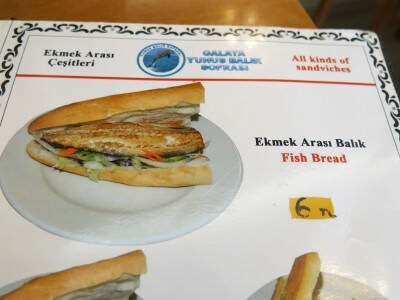 Fish sandwich in Istanbul, Turkey. 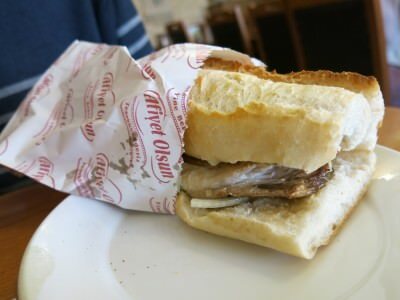 What is the Fish Sandwich in Istanbul? It’s basically a barbecued bit of fish inside a bread roll. It has some salad and mayonnaise in it. The fish is well cooked and has most of the bones removed. Be careful though! 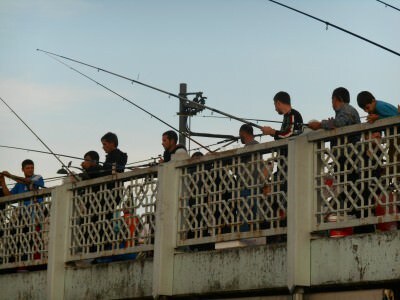 Fishermen in Istanbul catching the daily fish to be used in the fish sandwich. How much does the Fish Sandwich cost? For Istanbul prices, it’s a bargain for just 6 Turkish Lira. In fact, it should be the backpacker’s choice every night! 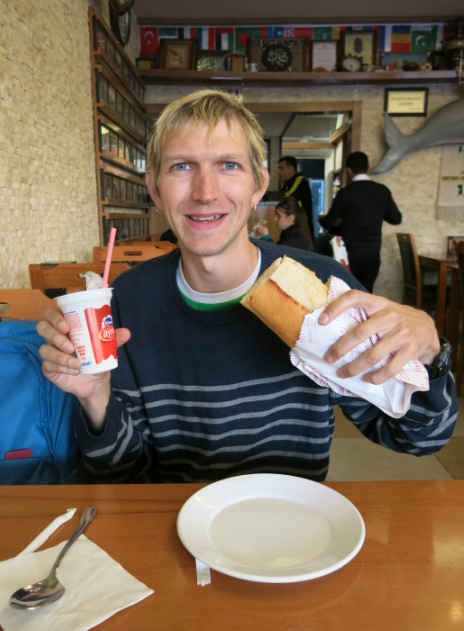 Friday’s Featured Food: Fish Sandwich and Ayran in Istanbul, Turkey. Where can you try the Istanbul Fish Sandwich? You need to head to the area called Misir Carsisi. The nearest tram station is Eminonu and it’s right by the river at the Golden Horn. Once you see the main bridge there – Galata Bridge/Galata Koprusu then head onto the bridge. You will see lots of fishermen there and a load of cool small restaurants all along the bridge. It will be busy and lively around later afternoon and also makes a great sunset viewing place. 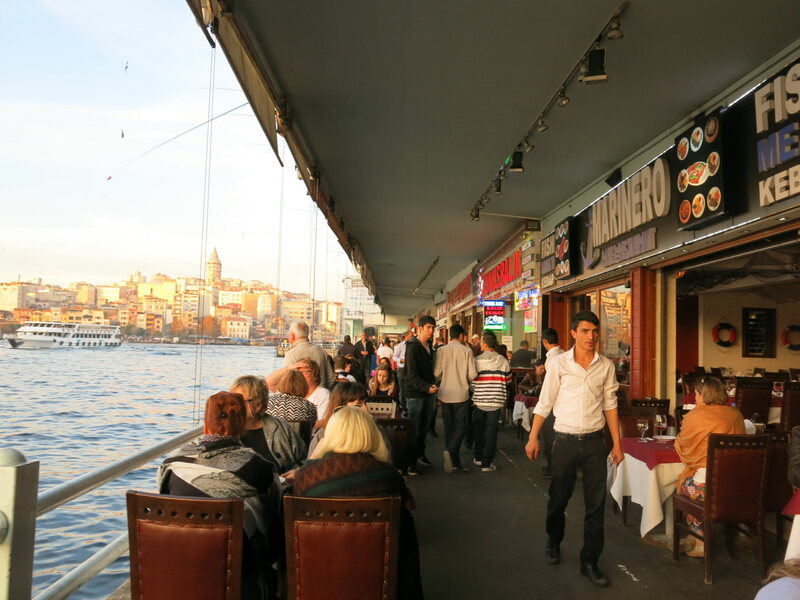 These fish restaurants are all along Galata Bridge in Istanbul. About 10 metres from where you ate it! The area of sea is the Halic/Golden Horn part of the Bosphorous Strait. 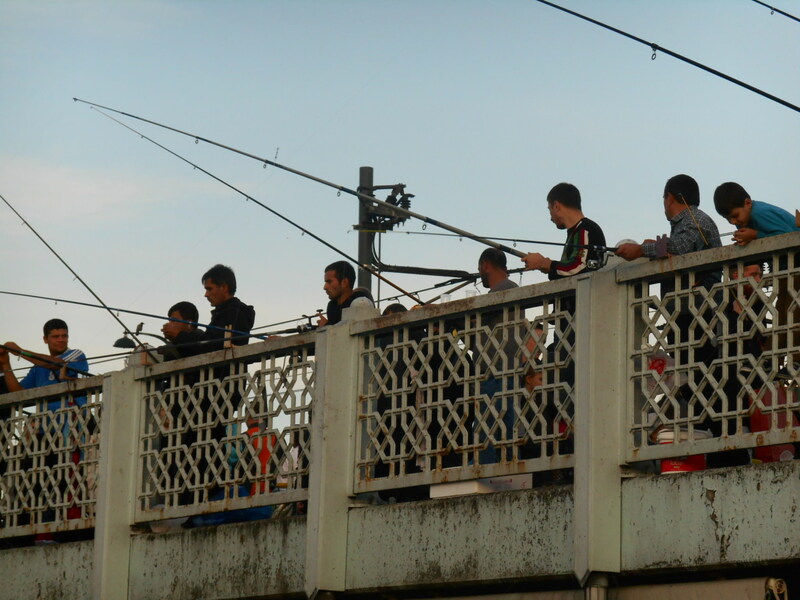 You’ll see hoardes of fishermen in Istanbul every day with their rods out, hoisting in new gems, making a bit of money and selling the fish to these restaurants that line the bridge. What is the fish sandwich like? OK so originally while eating I loved it. Tasty, salty, crispy and nutrient so I loved it. However about half an hour later I got a splitting headache – one of the only times I’ve ever got a headache from food. So while I enjoyed the food, I won’t be eating it again. Perhaps the fish from the sea in Istanbul are just too dirty for my stomach to handle. The shining Istanbul Night Sky, Turkey. This entry was posted in Central Asia/Middle East, Daily Features, Destinations, Friday's Featured Food, Istanbul, Turkey. Bookmark the permalink.